Watch the YouTube video if you have any problems with the following tutorial. 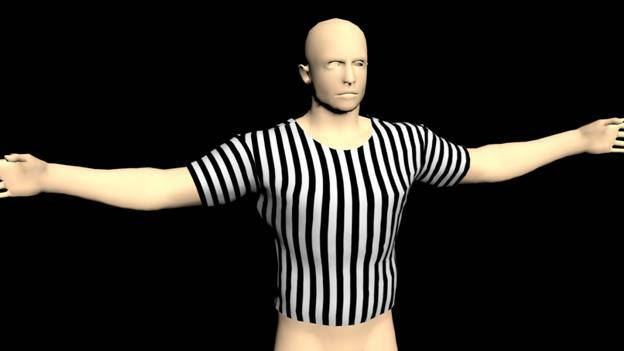 The following GIF shows how easy it is to wrap a cloth like a t-shirt, in a character model. 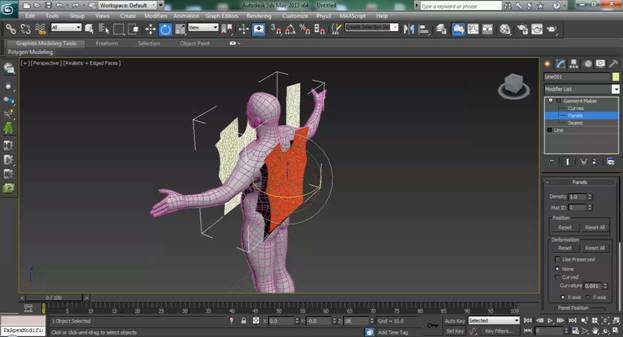 * Use the Line tool to draw outlines of the garment you want to simulate. * Break the vertices of those lines (to prepare for the next step). * Place a Garment Maker modifier onto the stack (above the line). * Start creating seams to connect the t-shirt pieces. * Apply a Cloth Modifier; adjust some settings, and (Simulate Local). 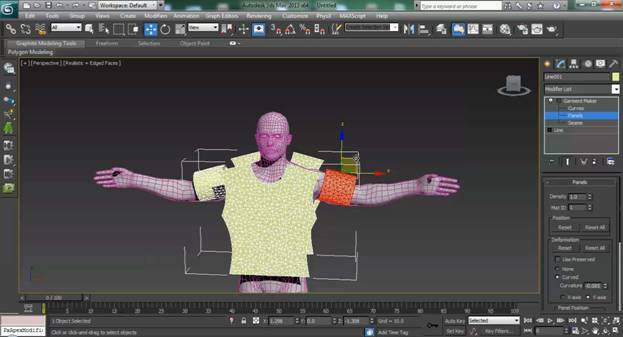 * Once the simulation wraps the t-shirt on your model, apply a texture. 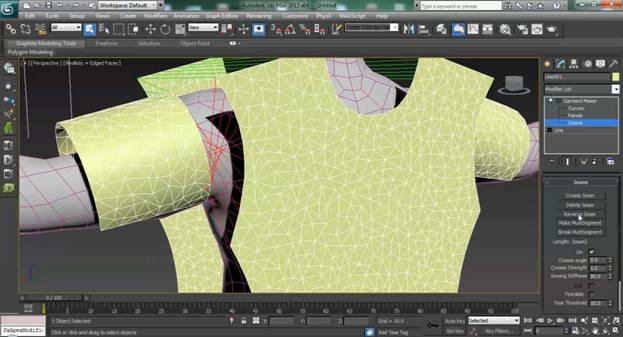 Now draw one side of the t-shirt with splines. Use Bezier Corners or Bezier when you need. Shift clone the line to the opposite side, and rotate it 180 deg in the Z axis to flip it. Then Attach the two splines. 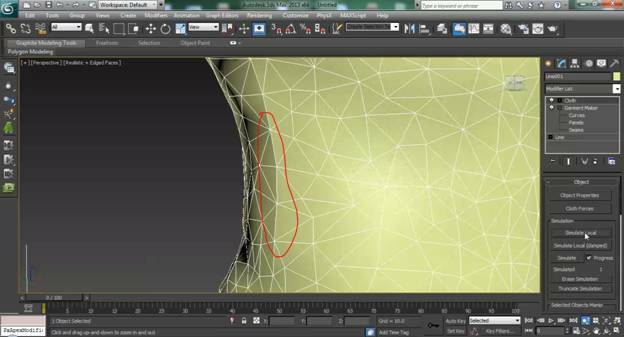 Go to vertex sub object level of the line and use Connect feature to connect the two halves at the neck area. After making and adjusting the neck, In Move mode, Clone the whole thing as we need 2 parts (front and back). Then make a rectangle line with double height of the arm area of the pattern as in the picture below. 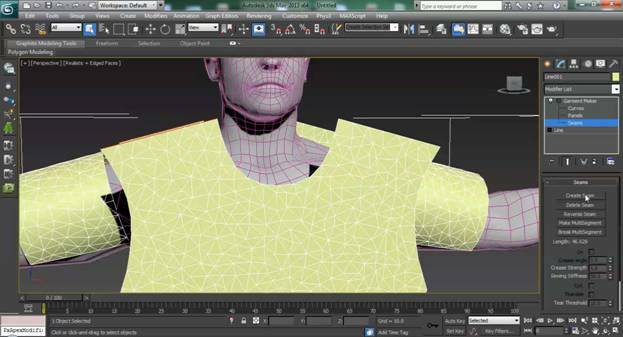 “Convert to Spline”, then use the refine in vertex mode to add a vertex on the middle of the line. Make a copy of that, flip and place on the other arm side. Then attach all of the lines together. Go to vertex sub object level, select all the vertexes and click on break. Again select all the vertexes and click on break just to make sure. We need to do this for the next steps comming up. Watch the video to get help with any part you have trouble with here. 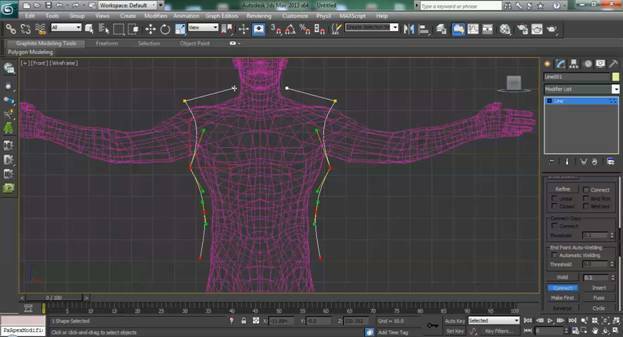 Apply Garment Maker modifier on top the line object. Then go to panels sub object level then select and place all the garments pieces in right position as seen below. For the back side, flip the pattern by rotating it 180 deg on the Z axis (or it will be inside out). For the arm sleeves, you can rotate them by -90 degees. Then adjust the curvature in the Panels. If it’s giving you the wrong direction of curve, change the axis from X to Y or Y to X. 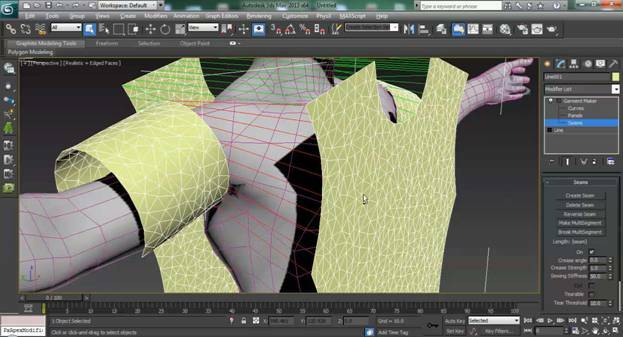 When you’re done with placing the garments in position, go to the Seams sub object level. Now select every two segments at a time which need to connect, and click on Create Seam. For the arms below, we already made 2 segments which have been sewn together. If you get an error like “seamed spline length not in tolerance” then scroll down and increase the value of seam tolerance slowly. Try increasing 0.1, 0.2, 0.3 or so. If you get crossed seams like the image below, the select the seam and click on reverse seam. The next image below that show how it should look. When you’re done with the seams, apply a Cloth Modifier on top of the Garment Maker. Then go to object properties in the modifier tab. In the window, click add objects and add your character model from the list (download the zip). Select the cloth object on the object properties window, select cloth radio button and change preset to Rubber. 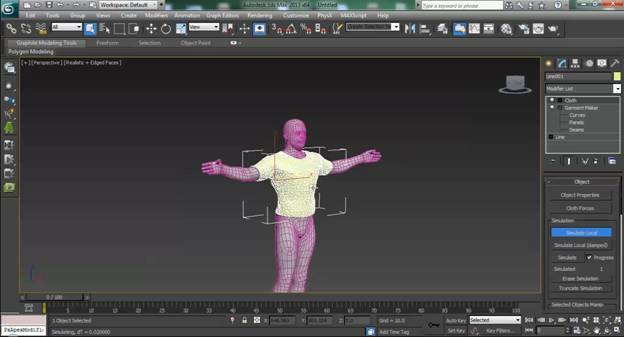 This will give us the parameters to run the simulation to make a normal t-shirt. Then select the character model, select the collision radio button and change the offset to 1.25. This will prevent the simulation from overlapping and interpolating the cloth with the character (which can mess up the output). If you click Simulate Local now, then you’ll see that the cloth will act like rubber and it will fall way down which is not like a t-shirt. So reset the simulation if you already simulated, then scroll down and turn off gravity in simulation parameters (uncheck it). Now click on Simulate Local and wait until you get a satisfied result. 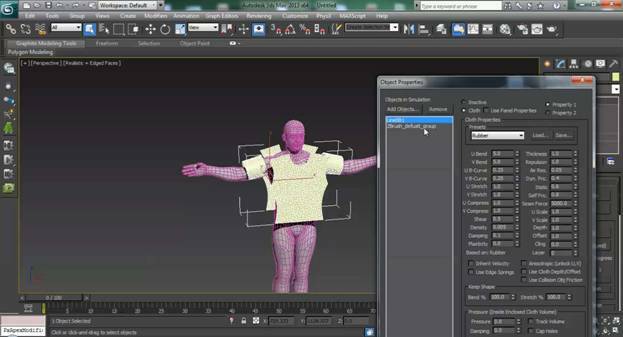 (Don’t run it for more than 25 seconds or so, or the simulation will shrink the shirt through the body of the model). 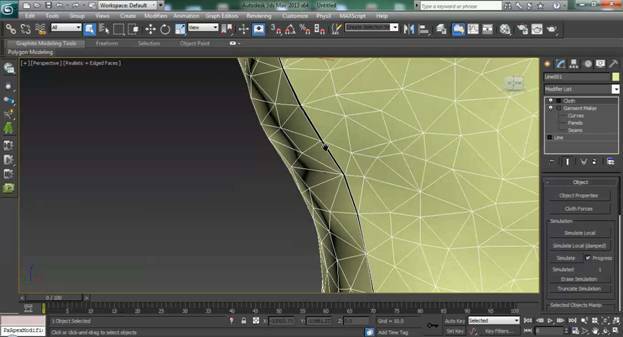 No matter how longer you simulate, you will see a small or longer gap in seams joints. To fix this, just scroll down and uncheck Use Sewing Springs and then simulate for a short time again. If you simulate a second time for longer, you may get weird results. Below is a sample rendering in 3ds Max with simple materials. You can apply textures on the simulated cloths just like you would apply them on the plane before the simulation. 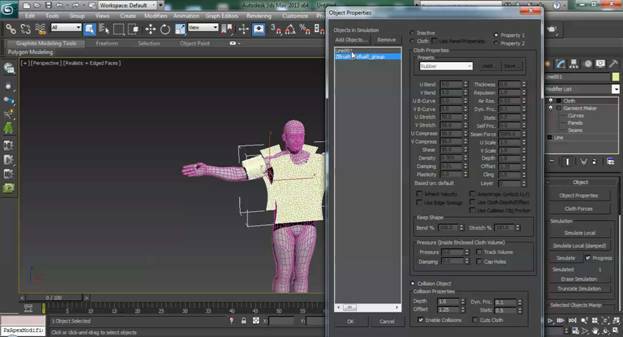 You can also convert the cloth object to editable poly to unwrap uvw and apply certain maps this way. Share, Tweet or Give us a thumbs up!